Martin Of Troppau (d. 1278; Troppau is now called Oppava, in the Czech Republic) joined the Dominican Order in Prague, and because the Dominicans belonged to the Polish province of the order, he was usually known as Martinus Polonus. He later served the popes in Rome. He wrote the first version of this text in 1265-8, a second soon after, and a third in 1277. 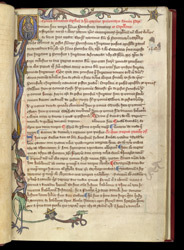 This copy was formerly part of another manuscript which was given in the early 14th century to Norwich Cathedral priory, and its decoration relates to the 'East Anglian' school of manuscript illumination. The text opens with an initial 'Q' depicting Christ enthroned, blessing, and holding an orb. Three margins are occupied by 'drolleries' in human and hybrid form, including a tall wading-bird with a very long neck and a king's head.